A Whitby veterinarian's guide to reducing stress for your pet during the holidays. The holidays are quickly approaching. We are all busy shopping, decorating and visiting loved ones. I’m sure, as you wander through the Oshawa and Whitby shopping malls, the last thing on your mind is “I should call my Whitby veterinary clinic, and see what I can do to help reduce my pet’s stress over the holidays”. 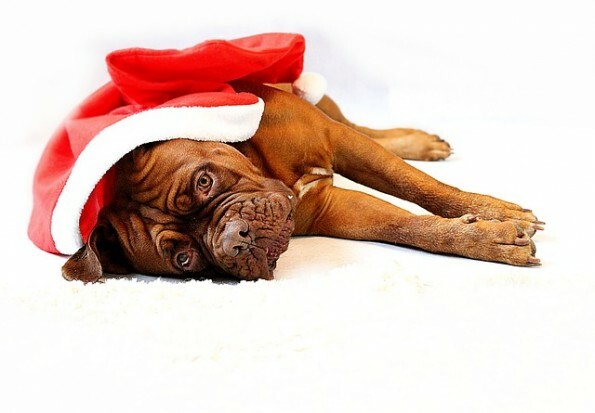 Many people can relate to being stressed during this time of year, but few stop to think “Is my pet feeling anxiety as well?” For most owners, pet stress and anxiety is often not high on the “to do/see your veterinarian for list” until a problem arises. Our pets are often silently dealing with added stressors and anxiety at this busy time of year, and they often do it with much more grace than we do. So please keep in mind that there are things we can do as pet owners to help minimize our pet’s stress, which in turn, reduces the negative affects to their immune system. New and different people in the household. Increased household activity, i.e. parties, visitors, children playing. New household items, such as decorations, Christmas trees, chocolates and edible hazards, etc. Increased travel to friends and family, with and without your pet. Pets will also pick up on our added stress and anxiety. Keep to a normal routine as much as possible. Same meal times. Same exercise/play schedule. Increase your pet’s exercise. Particularly for active dogs. It will help them release their stress and energy. Do not make changes to your pet’s diet. Only give new treats or gifts in moderation and under supervision. Keep extra household food i.e. cookies and snacks your of your pet’s reach. Remind visitors where it is safe to leave food and items out of your pet’s reach. Don’t force your pet to interact with new people. Create a quiet comfort space. Consider using a pet sitter instead of a boarding facility so that your pet may stay in their own home. We recommend using a pheromone spray to help reduce anxiety and stress. Feliway for cats and Adaptil for dogs. These are great products that can be used during travel, when extra visitors are present, when pet is alone more, etc. Cats in particular do not like it when furniture is moved. Cats have specific pathways then use to reach their food and their litterboxes. These changes can be very stressful and Feliway can be very useful in this situation. There are nutraceutical products available through your veterinary clinic that may be suited for your pet to reduce anxiety. If there is any concerns or questions about your pet’s health, please call your Whitby veterinary clinic to discuss. Above all, the most important thing to remember, is lots of TLC and a really great present from Santa.